Thought I had run out of steam where couscous is concerned? Wrong- think again! 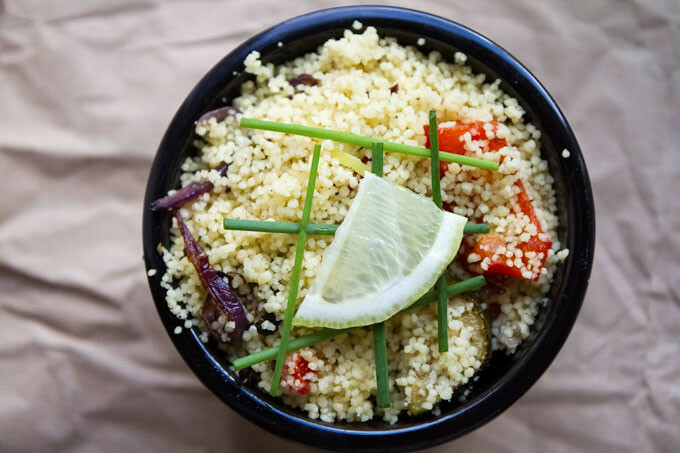 This is one of my favourite couscous recipes, and one I have been making for nearly 10 years. It has taken several iterations to get this recipe as I wanted it – it first gained popularity when I cooked in for some of my university friends when studying for my MA in Marketing of all things. Couscous with roasted Mediterranean vegetables takes a few minutes to prepare, under an hour to cook, and is packed full of flavour. Garlic, chilli, lemon and herbes de Provence work really well together. I am really looking forward to my lunches at work for the next few days- this is something I struggle to bore of. As a word of caution, depending on your love of chilli, this can become a little fiery, particularly if you add the chilli flakes. Aubergines seem to act as a flavour and heat sponge which can be good in one respect, potentially a little overwhelming in another. 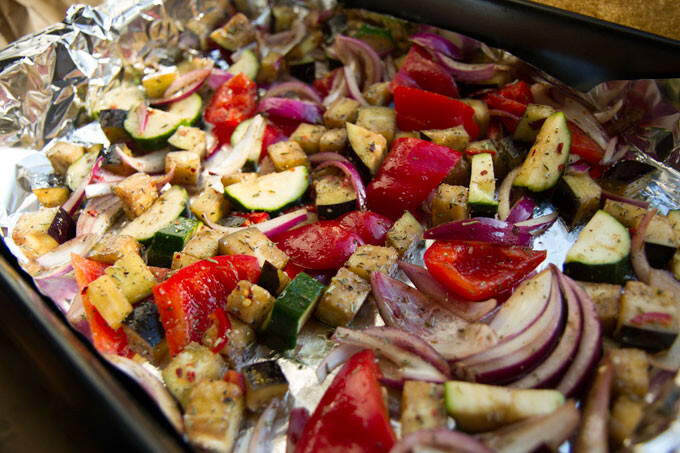 Make sure that you spread out the vegetables on the oven tray so that they can roast evenly. 1 x medium courgette, quartered horizontally, then sliced into wedges. Take a large bowl (you will need this) and combine all the vegetables together. Using salad spoons or large serving spoons, gently mix together. Add the olive oil, herbs, salt, crushed garlic, pepper, chilli and mix again, ensuring that everything is evenly coated. Drizzle over the balsamic vinegar and season well. Take out the hot oven trays, and divide the vegetables evenly between the two. The reason for 2 x trays is that I find that the vegetables roast much better when evenly spread out, otherwise the tend to get a little soggy. Roast for about 20 mins, the remove from oven, and turn the vegetables over. Return to the oven for another 15-20 mins until cooked. Do keep an eye on them though and check towards the end. I like my vegetables (unlike to steak) to be crispy and caramelised – it is your choice entirely. Once cooked to your liking, remove from oven and mix into the couscous you made earlier. Once evenly mixed, you can add some fresh lemon juice, drizzle a little more olive oil and scatter some fresh parsley. So that the contents of both oven trays are evenly cooked, I tend to rotate the trays half way. The top of an oven is always hotter!